The annual Hong Kong Asian-Pop Music Festival was held on 23rd March 2018 at the Hong Kong Convention and Exhibition Centre. Homegrown artistes, Tay Kewei and The Façade performed alongside top recording acts and top rising popular music acts from eight other regional countries, including Mainland China, Hong Kong, Taiwan, Japan, Korea, Malaysia, Thailand and Vietnam. Local singer, Tay Kewei, was a former Asian Supernova Award contestant. She was selected to perform as an emerging artiste back in 2011 and now she is invited back to perform as a guest performer after she has established great fame. For this performance, Kewei performed her original Victorious (胜利在闪耀) and covered 天天想你 by Chang Yu Sheng. This is the first time she performed Victorious after it has been released on music digital platforms. The other top recording artistes performing in HKAMF 2018 were Phibian (Wang Hao) and CJ Swag (Chi Yuehan) from the Chinese boy band M.I.C. from Mainland China, Supper Moment from the host city Hong Kong, Lala Hsu from Taiwan, Mika Nakashima from Japan, BTOB from Korea, Jannine Weigel from Thailand and Noo Phước Thịnh from Vietnam. 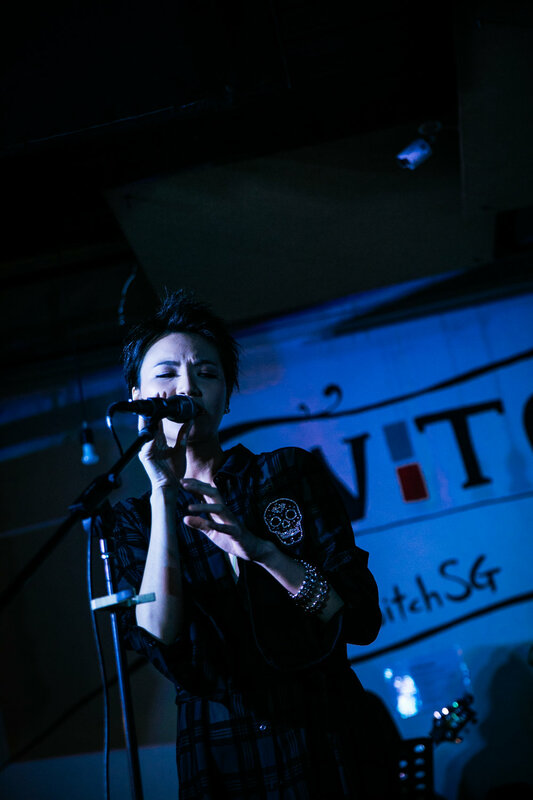 Local alternative pop-rock band, The Façade competed alongside Huang Yuli from Mainland China, Lydia Lau from Hong Kong, Sway from Taiwan, Anly from Japan, MINSEO from Korea, Priscilla Abby from Malaysia and TACHAYA from Thailand under the HKAMF 2018 Supernova Contest for various awards, including, the HKAMF 2018 Supernova Award, HKAMF 2018 Best Vocal Performance Award and HKAMF 2018 Best Stage Performance Award. Aside from these awards, contestant who secures highest number of votes during the live voting gets to win the HKAMF 2018 Top Viewers’ Choice award. The band is honored to be given this opportunity to perform on an internationally renowned music event. Last year, they represented in the Chengdu International Sister Cities Youth Music Festival and now, they have been given this opportunity to perform their original single ‘Better Than This’ at the Hong Kong Asian-Pop Music Festival. Immediately after the event, the single claimed #7 spot on the iTunes Top 200 Tracks Hong Kong Alternative Chart. The highly anticipated annual music festival, Hong Kong Asian-Pop Music Festival (HKAMF) is back with its eighth edition this March. Local singer-songwriter Tay Kewei has been invited as part of the top recording artiste lineup of HKAMF2018 and Alternative Pop-Rock band The Façade has been selected to represent Singapore at the Asian Supernova contest hosted by HKAMF. Invited guest performers from the previous runs include local acts such as JJ Lin, Kit Chan , as well as regional acts such as Ding Dang (China), FIR (Taiwan), Super Junior (Korea), Girls’ Generation (Korea). Hong Kong Asian-Pop Music Festival (HKAMF) 2018 will be held at Hong Kong Convention and Exhibition Centre on 23 March 2018.
business and supported by Cross Ratio Entertainment as its Official Music and Event Organiser, the carnival is all about celebrating live music and showcasing home-grown talents. fresh brew. If not, standard F&B package which is going as low as $25, is also up for grab. Entry are given based on a first come first served basis. Stärker Music Carnival will be taking place on 4th November 2017, Saturday at Tanjong Pagar Centre’s L1 Urban Park outside Stärker Signature. 2017! Ling Kai’s EP Launch <UNLEARN> media conference was organise by artiste management company Cross Ratio Entertainment, was held yesterday on 5 October 2017, at SWITCH by Timbre. Kicking start the conference , Ling Kai shared her thoughts and feelings of releasing this EP with YES 933, DJ Kunhua, who was the host for the media conference. She reflected on her journey of being an artiste for the past decade. Through this introductory segment, it was evident that the homegrown singer-songwriter has certainly returned stronger, with a more mature mindset this time. filming. A full size room was specially customised and built - which was later demolished for the later scenes of the video. During this segment, the director of the MV, Glenn Ng, was invited on stage to share about the finer details of the music video and explained the reason why it took so many people to produced this special video. Mandarin Pop industry. He expressed his pleasant experience of working on the EP with Ling Kai. After the media conference, Cross Ratio Entertainment had also organised a listening party at the same venue, showcasing her EP<UNLEARN>. Fans, friends and family of Ling Kai, and even local celebrities such as Ya Hui, Alfred Sim, The Freshmen, Jack & Rai all came down to support Ling Kai and her joyous occasion, filling up the venue to its full capacity. She serenaded the audience with a high energy full set of songs from the EP, some original songs from her previous EP, ‘Honestly’. In between the set, she highlighted her key source of inspiration and stories of creating her originals to the audience. She wrapped up the listening party with her EP title track, ‘Unlearn’, accompanied with the melodic tunes played gracefully by the violinist.